I have been following Olives for Dinner for a while, and Erin's originality is astounding and her generosity for sharing her recipes definitely praise worthy. I have a number of her recipes bookmarked including her Carrot Lox recipe. I have been waiting for an excuse to make it. The reason for finally making the vegan Smoked Carrot 'Salmon' came to me last week, when it was one of my good work colleagues birthday. This colleague happens to be vegan. One colleague who is an excellent baker had decided to make her some vegan chocolate cupcakes with Lotus Biscoffi 'butter cream'. 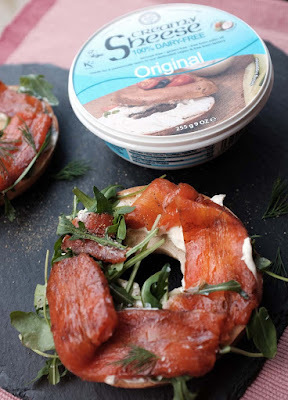 I had decided to have a go at making the classic Cream Cheese and Smoked 'Salmon' Bagels for her, only vegan style! 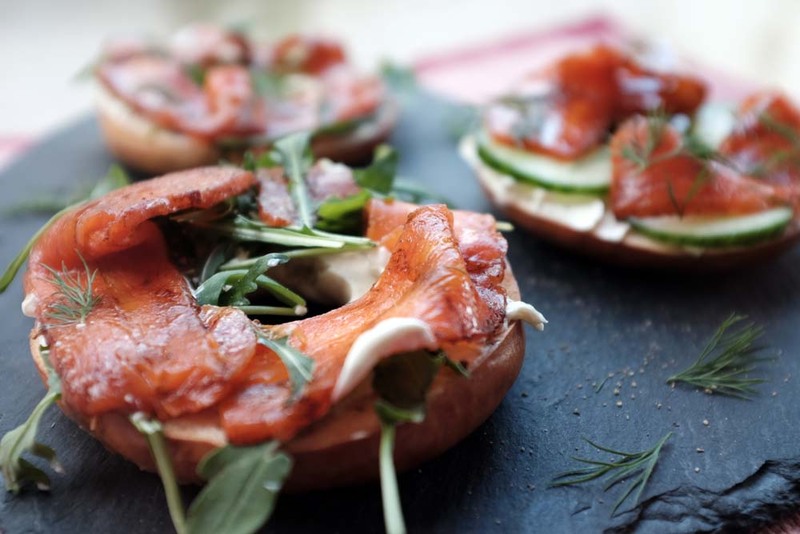 The first time I ever had smoked Salmon was by pure accident. It was on a flight from Paris to San Francisco many, many years ago. I was assured by the flight attendant that the ready made vegetarian meal I was having was indeed vegetarian, even when I questioned it. I didn't even know what smoked lox was then. I remember the taste in my mouth and it stuck with me and tasting this vegan Smoked Carrot 'Salmon' transported me back to that memory. D my husband who is not vegetarian and does still on rare occasions (only if and when we go out for meals) eat seafood and fish was totally amazed at how the Smoked Carrot 'Salmon' mimicked the silky fleshy texture of the real thing. Full credit for the recipe and inspiration for the Carrot Lox goes to Olives for Dinner. I made the Smoked Carrot 'Salmon' in a loaf tin lined with baking parchment paper. I also only used 1 and a 1/2 cup of sea salt as that is all I had. I subbed white wine vinegar as I have not been able to source coconut vinegar near where I live. I also read the comments in the original post and substituted the olive oil for flaxseed oil that you can get from most health shops. In future, advice to myself is to use much thicker and fatter carrots next time as the smoked carrots felt a little tender going through the mandolin. I made the classic Cream Cheese and Smoked Carrot 'Salmon' Bagel fresh at work for my colleague. 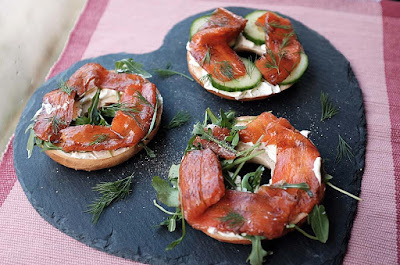 I sliced open the chewy bagel, slathered over Bute Islands soft vegan Creamy Sheese and layered the vegan Smoked Carrot 'Salmon' in generous folds . She absolutely loved it. Only thing, she confessed she had never had real smoked salmon so was unable to compare it previous experiences, she was still very very happy with her edible gift. 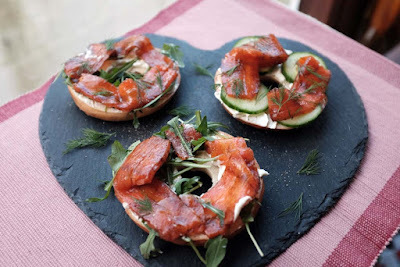 The vegan Smoked Carrot 'Salmon' is a very convincing substitute and its quite fatty and oily in texture that I have been inspired to have a go at making vegan Scandinavian style Gravadlax soon too. 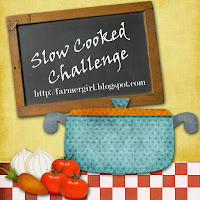 I am sharing this awesome recipe with Baking Queen Slow Cooked Challenge. You will also find other awesome carrot recipes on How to Make Bacon with Carrots and Other Vegetables from PeTa and it gives credit to Carrot Bacon to Meet The Shannons. I have also recently made Aubergine aka Eggplant Bacon and Seitan Bacon and will share soon. Place half of the sea salt into the loaf tine lined with baking parchment paper, then place the carrots on the sea salt. Cover with the remaining sea salt. 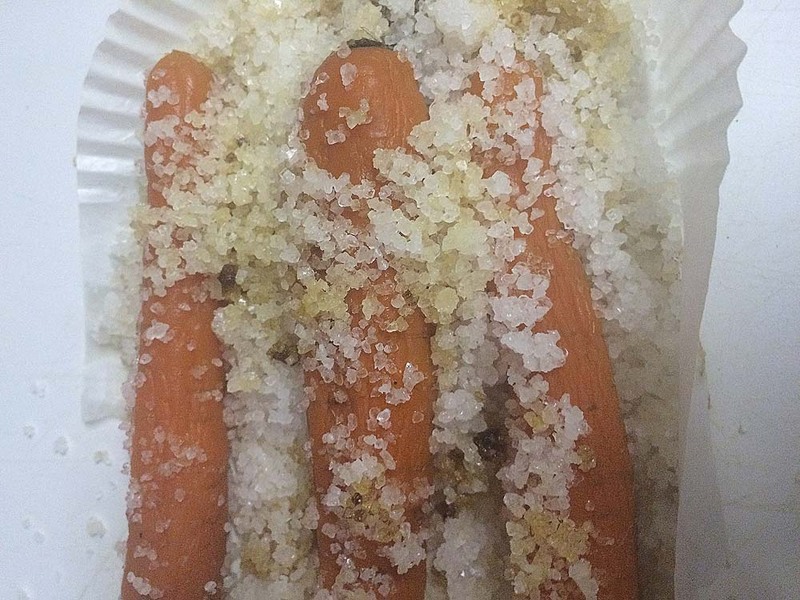 The sea salt will not cover the carrots completely. Cover the loaf tin with foil. Place in over and roast for an hour or so. Remove from the oven and allot to cool. Transfer to a wooden chopping board and allow to cook. When cool enough to handle, brush away the excess salt and peel off the skin if possible, if not don't worry. 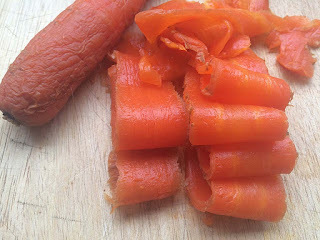 Then using a mandolin, very carefully finely slice the carrots into thin strips. Transfer the carrot slices to a glass container with lid. In a small bowl, whisk together the oil, liquid smoke and vinegar and evenly pour over the carrots to marinade. Transfer to fridge for a couple of days for the flavours to develop. 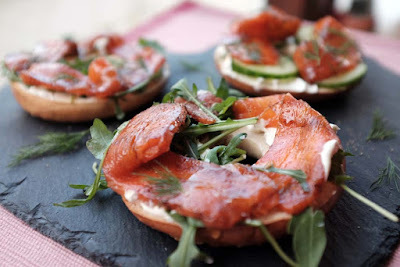 I know 2 cups of sea salt is a bit much , so here is a link to another recipe for Carrot Lox recipe The Flaming Vegan if your interested in having a go at home. I am sharing this blog post with Honest Mum for Brilliant Blog Posts; The Flexitarian ; and with Confessions of a Mother Runner and Whisk and Two Wands for Meatless Monday. This recipe was also made by Belinda at Plot 7-Marsh Lane. Wow! That looks amazing. I'm not sure whether I've ever had smoked salmon but the ONE thing I get a crazy longing for is kippers! I've not given in, but I wonder if the liquid smoke could help me with that...? Thanks Belinda. It is an amazing recipe and I recommend it. Liquid smoke is an amazing ingredient. 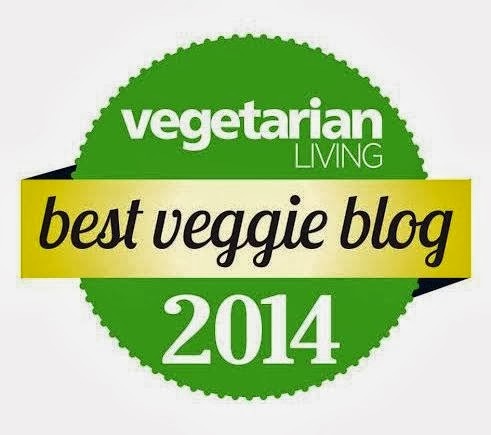 I love transforming veggie like this, thanks for sharing! I found you at Meatless Mondays. Johanna, it would be my honour to - Just imagine - if we were working with together! You'd be totally spoiled with my experimental eats and I am sure it would be the same the other way around. I saw a similar recipe somewhere recently and was quite tempted to try. You certainly made an excellent job! Yes its probably was a copy of the original copy. 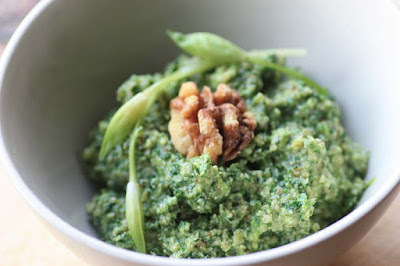 This is indeed a fantastic recipe so I can see why many people have been inspired by it. Holy moly girl! I almost skimmed right by this post as your picture looks uncannily like salmon. Scary haha. My husband is peeking over my shoulder right now and we are both very intrigued by this. I will have to give it a try! "I was assured by the flight attendant that the ready made vegetarian meal I was having was indeed vegetarian"
Hi Kimmy. My husband eats fish and seafood and even then its never featured on my blog only vegetarian and vegan grub on my food. My husband was well impressed with the likeness of this and how it tasted. 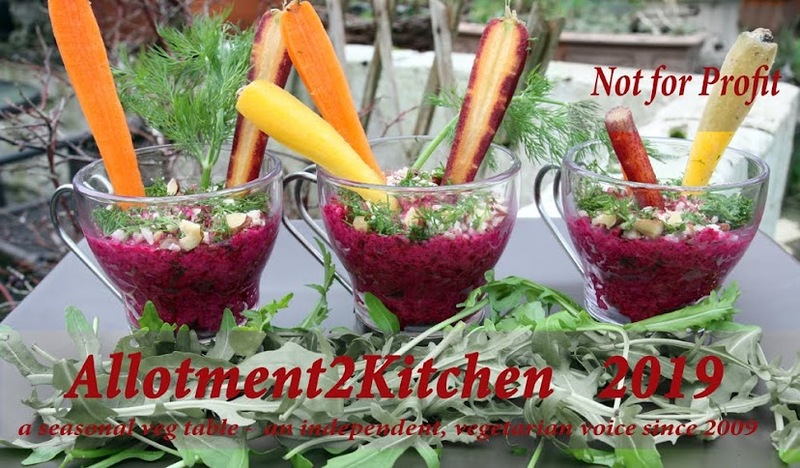 It is a very impressive recipe thanks to the creator for sharing it with us. As for the flight attendant...I was a lot more politer in those days ,..its so worrying that many people see fish as vegetarian when it is clearly not. Anyway, please do give this recipe a go. I am so excited by this! What a creative recipe and one I will definitely try. Kari, it is one of the most original and exciting recipe I have come across in a while and I thank Olives for Dinner for sharing it with us, i have seen lots of spin offs since, but my version belongs to the original, I just had to make some tweaks with what I had, it does not make it my creation at all - credit given where its due. It really was very good and liquid smoke is such a magical ingredient for us veggies. Wow what an amazing recipe! I had no idea you could use carrots in this way. The long roast and the marinating makes is a very slow cooking experience doesn't it! Thanks very much for sending your vegan smoked carrot bagel over to the Slow Cooked Challenge! Lucy, Yes - it really is amazing. I look forward to joining in again, thank you so much for hosting.